The Best Funeral Potatoes are a mainstay in some circles. If you’re familiar the Mormon church (where they’re also called Utah potato casserole), you might already know about them. If you’re not aware of them — don’t ever let a recipe name kill your appetite. 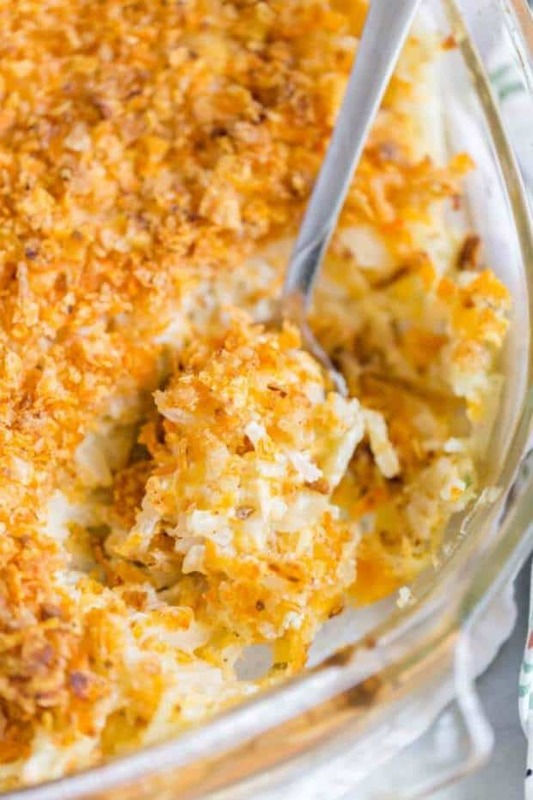 The Best Funeral Potatoes are actually just a cheesy potato casserole. They are so delicious that you’ll want to devour the whole entire casserole yourself. No joke. The recipe calls for things like butter, onion, sour cream, and cheese. You can cook it from scratch with no soup or use homemade soups or make a quick version with canned cream of mushroom soup. Versatile! Topped with potato chips or Doritos. Oven baked (about an hour at 375°), or cooked in the crockpot (on high, for about four hours). And, yes, you can make this ahead of time and freeze it, too. Bake it at a slightly lower temperature for a couple of hours or until everything is bubbly. I can’t tell you how many times I’ve just wanted to pick up the entire dish and run with it and eat it all because they are so good. Where did the name funeral potatoes come from? Often after a funeral there is a tradition of the family regrouping for a meal after the graveside service. 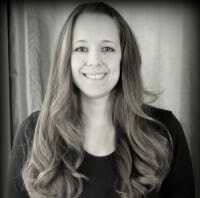 Friends, a women’s church group, or a service club usually provide the meal. 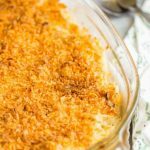 Funeral potatoes are easy to make for a large crowd and everyone seems to love them so they often make the menu for sizeable groups. We could say funeral potatoes by any other name would sound a lot better! 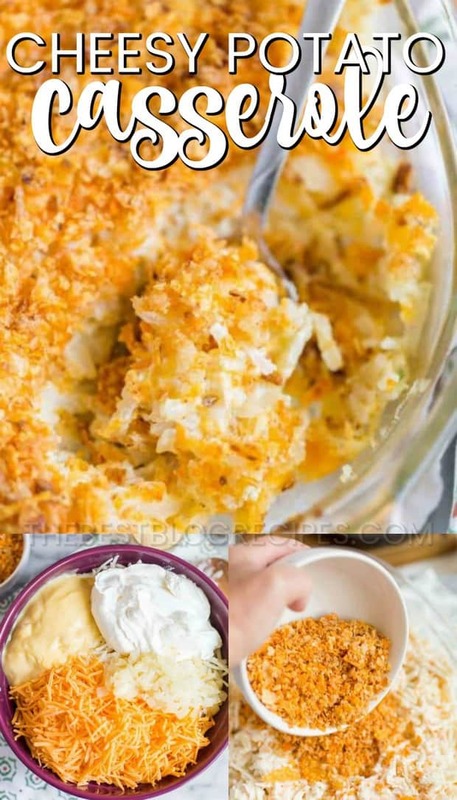 🙂 I discovered funeral potatoes do go by other names, too, including potatoes delicious, cheesy potatoes, church potatoes, and (my favorite) party potatoes. 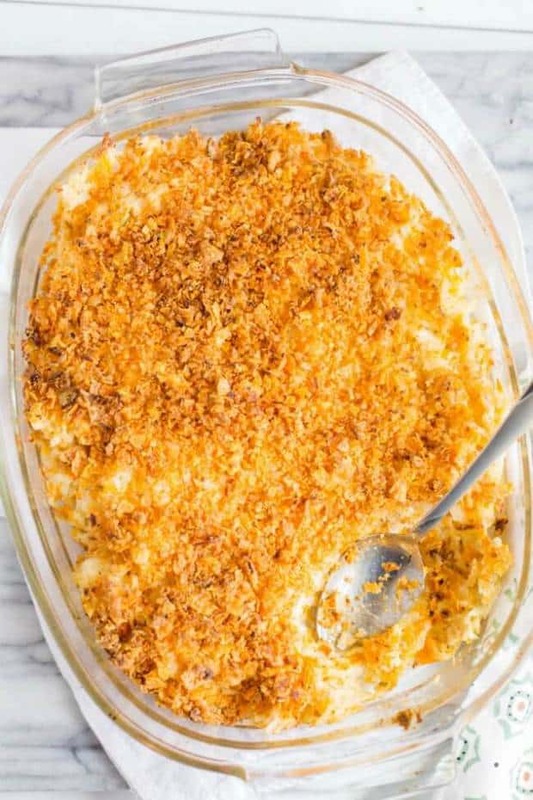 Whatever you call them, this creamy, cheesy potato casserole is a wonderful comfort food; you don’t have to wait for funerals to eat them. The Best Funeral Potatoes are also enjoyed at potlucks, graduation parties, and family reunions. And this particular recipe has become a highly requested dish at our house. My current favorite is the recipe I’m sharing here, but it’s always fun to get adventurous in the kitchen and switch up recipe ingredients. Here are a few modifications that also add flavor to this casserole that can serve as a delicious side dish or an entire meal. A note on the potatoes: Everyone seems to have their favorite version but frozen and then thawed hash browns, diced hash browns, or tater tots are the top choices. You can also boil (with skins on so they don’t become too watery), peel, and cube russet potatoes. Add-ins: Mushrooms, green or red peppers, freshly minced garlic, green chilies, corn. Make it creamy: Full fat, low fat, no fat? You choose! Sour cream, cream of chicken soup, cream of mushroom soup, cream of potato soup, cream of celery soup, cheese soup, plain Greek yogurt, plain almond milk. Make it cheesy: Cheddar (sharp or regular), Parmesan, Pepper Jack, American, Velveeta, cream cheese, smoked gouda. I have been known to include a triplet of cheeses, too. And a little more protein: Bacon bits, ham, ground beef, sirloin, chicken chunks, turkey, smokies. Toppings: Doritos, crushed fried onions, potato chips (rippled chips are the crunchiest), corn flakes, seasoned bread crumbs, crushed saltine crackers, Cheez-It crackers, panko. Homemade Cream of Chicken Soup: I use a can of Cream of Chicken Soup when I am short on time. However, if you want to make your soup from scratch, check out this seriously yummy Condensed Homemade Cream of Chicken recipe to share with you. And if you’re familiar with the blog, Pioneer Woman, by Ree Drummond, you might want to check out the Kicked-Up Tator Tot Hotdish version shared on that site. There are additional veggies, she includes meat and turns up the heat with jalapeños, Pepper Jack cheese, and Tabasco. 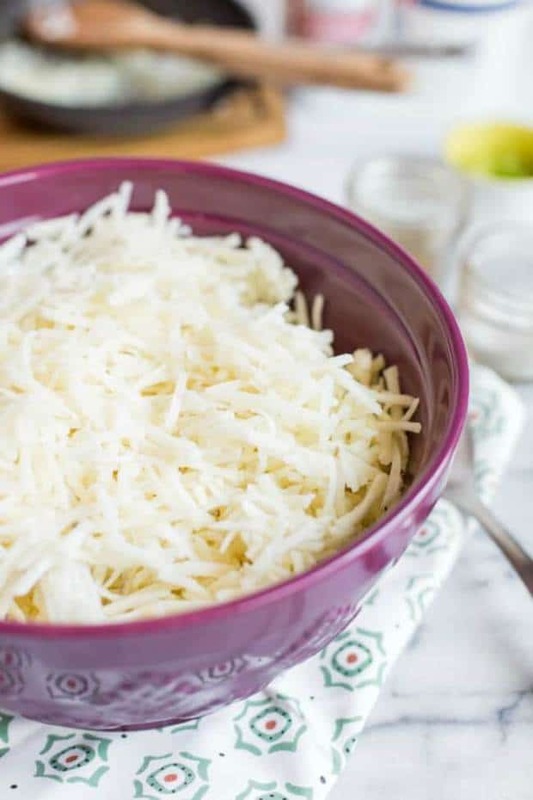 The Best Funeral Potato recipe is a delicious way to make a cheesy potato casserole that your whole family will love! I used a large gallon size bag and a rolling pin to crush my French's Onions and Doritos. 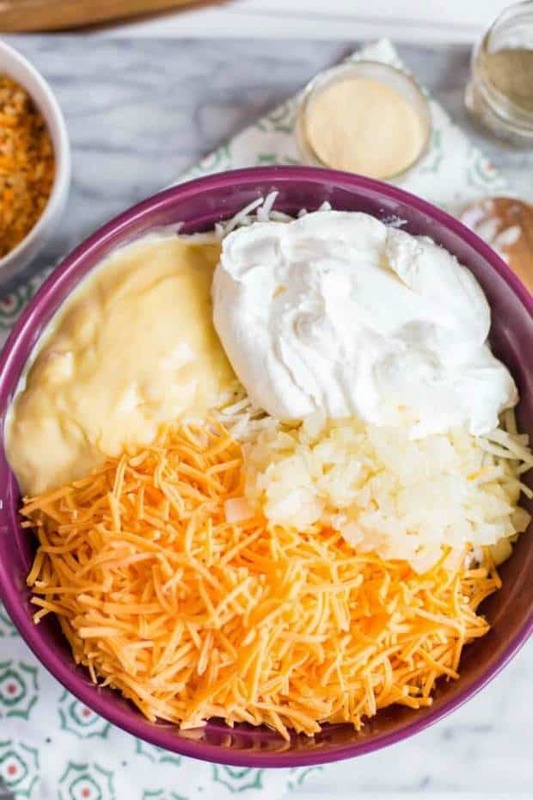 In a large mixing bowl combine your hash browns, salt, black pepper, chives, sour cream, shredded cheddar cheese, cream of chicken soup and your cooked onion. Stir well. It may take some serious arm muscle to work this all together if your hash browns are still frozen but should mix easily if thawed. Preheat your oven to 375°. Put your potato mixture into a 9x13 casserole dish and cook in the oven for 30 minutes. Take out and stir the whole casserole well. Put back in the oven and continue to cook until it's bubbling on the sides and in the middle, about 20-30 more minutes depending on your oven. Once it's bubbling in the middle you know it's done. 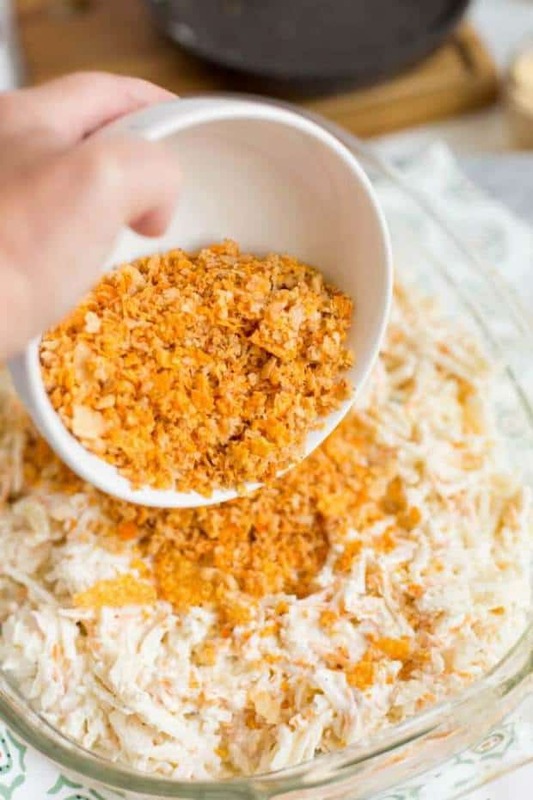 Take the casserole out of the oven and sprinkle your crushed onion and Dorito mixture on the top. Put back in the oven for an additional 5 minutes but watch carefully so the topping doesn't burn. This recipe is a favorite in our house and I like to make it with frozen hash browns. Yum! These were amazing for our Christmas Eve dinner. I didn’t have to cook mine as long after putting the topping on, so just keep an eye on them. Thanks for sharing. Just the regular, standard size. We made this dish and it was scrumptious. Are the Doritos necessary? I feel like it would make them super salty… Or does it make it was better? I use corn flake crumbs on mine. Shredded has brown potatoes or cubed hash browns or does it even matter? My family loves these! I top them with crushed potato chips or buttered crushed corn flakes. Would I be able to make them a day or two in advance? I am making them for Christmas and I would love to have as much prepped as I can beforehand! Yes! You could definitely make these in advance! Thank you. I don’t love the name either, but it seems to be a pretty common term for these particular potatoes. I hate the name, but these potatoes look absolutely scrumptious! I love it when a recipe is super quick with prep time! I know, right? And delicious too!